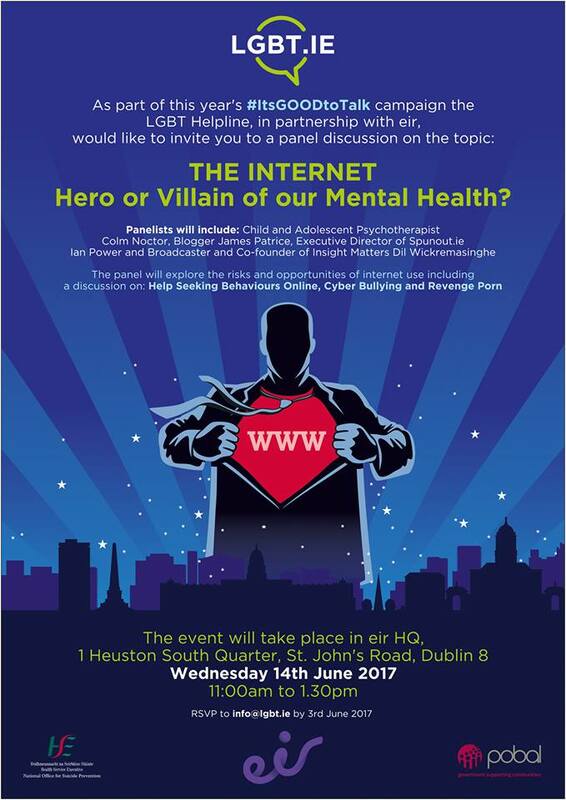 The LGBT Helpline, the national support service for Lesbian, Gay, Bisexual and Transgender people, will hold an event exploring the role of the internet in the lives of LGBT people, tomorrow, Wednesday, 14th June, 10.45am, at the headquarters of eir, 1 Heuston South Quarter, St. John’s Road, Dublin 8. ‘It’s Good to Talk’, a positive mental health campaign by the LGBT Helpline and eir, will be launched at the event. The campaign will see the two organisations working together throughout Pride 2017. Ian Power, Executive Director of Spunout.ie. “2017 will mark the second year of our Pride partnership with eir. The partnership has a specific focus on promoting positive mental health. “Statistics show that social media use tends to be higher amongst LGBT people than the general population, and – through our support services – we are seeing a number of trends emerging in relation to online behaviour, which impact on people’s mental health. These include growing numbers of LGBT people choosing to come out online and increased incidents of cyber bullying. Full details of the LGBT Helpline and eir ‘It’s Good to Talk’ campaign will be detailed at Wednesday’s event. The LGBT Helpline is the national support service for LGBT people, their families and friends. It was established in 2010 and is run through a network of local helpline centres and a range of online services. The organisation’s teams of trained volunteers provide confidential support and information through the telephone helpline, online chat service, peer support service and the LGBT.ie website. The helpline number is 1890-929-539. For further information, visit www.lgbt.ie or follow @LGBT_ie on Twitter, #itsgoodtotalk.